In recent years, content marketing has begun to receive more and more attention, as classic online and offline forms of advertising have lost buyer confidence points. Consumers are becoming more selective as their needs shift towards more time-saving, relevant and accessible resources. In short, content marketing is a component of an overall marketing strategy, focused on creating and distributing relevant content to attract or stimulate the interest of a target market. Whether we are talking about generating more leads, educating the consumer or raising awareness of a brand, it is key to use relevant know-how and creativity to produce interesting, useful pieces of content that bring added value into the reader’s life. The content marketing mix incorporates articles, infographics, videos, guides, white papers, etc. in a coherent blend. From Facebook posts to news feeds, content must uphold coherence and consistency in communication. Here is a list of the various types of content to adopt depending on your business objectives. Before writing a single word, we must make sure to know exactly to whom we are speaking. A solid understanding of the user allows us to apprehend her attitude towards our brand and our industry, her need (pain points) for a product/service, the motivations behind her current brand choices, and so on. If you already have an existing customer base, you can use analytics software (such as Google Analytics and Adobe Analytics) to explore your readers’ and customers’ profiles and behaviours. 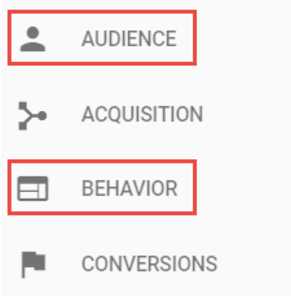 In Google Analytics, for instance, we use Audience and Behaviour reports to find out more about our site visitors. Other tools, such as Hotjar and CrazyEgg, are able to track users’ interactions on visited pages and produce heatmaps (to see where visitors have clicked on the page), scrollmaps (to see how far visitors have scrolled down), and even screen captures to study the cursor movements and actions of the Web surfer on a given website. If, on the other hand, you do not have an existing client base, you can get valuable insights about your target audience on platforms such as Statistics Canada, Google Trends, Cefrio, IBISWorld and eMarketer. Moreover, tools such as Google Suggest (Free), UberSuggest (Free), Answer The Public (Free), Adwords Keyword Planner (Free but requires a Google Adwords account) and KeywordTool.io ($$) provide us with the keyword data and user questions required to define the nucleus of individual pieces of content. The reason why I am dwelling on these elements is their utter importance, as they allow us to provide adapted content that does not only resonate with your readers, but which responds to their immediate needs. The intelligence that we obtain through either analytics services or public market data help us calibrate our content activities and adopt relevant content formats that fit our audience like the glass slipper fits Cinderella’s foot. An optimized blog can be not only a significant source of qualified natural traffic, but also a conducive environment for developing controlled discussions about our brand and products. With the growing need for brands to provide fresh content on a regular basis, collaboration with consulting agencies and those specializing in content production has become more significant. Indeed, not all brands possess the necessary in-house resources or expertise to manage and produce their content. Certain skills—such as the ability to vulgarize sometimes complex/technical information to make content understandable; the awareness of on-page SEO factors and web copywriting best practices; mastery of tools for collecting and analyzing keywords; etc.—are essential for the development of effective content strategies. A lack in these specialities prompts brands to work with agencies such as Adviso. Our job as content marketers is to accompany clients such as National Bank of Canada and Arctic Gardens fine-tune their digital content strategies. We do so by helping them identify targeted tactics for achieving their objectives through content—whether it’s creating brand awareness, generating sales leads, educating consumers, etc. Moreover, we provide guidance in defining their target audiences and identifying the types of content that not only resonate with their readers, but which are aligned with marketing objectives. We collaborate closely with content producers, as well as freelance journalists and copywriters, to bring content ideas to life. Once a content campaign is set in motion, Content Marketing specialists carry out the keyword analysis and benchmarking, create the content briefs, and revise the texts, all while closely following-up with our clients to get the latest updates. Now, both content planners/strategists and writers need guidance to be able to grasp your expectations and vision, as these will determine the mandate’s outcomes. The content brief is the holy document that provides context and direction. The glue that brings brands, content strategists and writers together. The character of the final piece depends on it greatly. So, how do you create a brief that produces successful outcomes? When it comes to preparing content briefs, opinions can be divided: some opt for written documents, while others may prefer receiving verbal clarifications. Although the latter version works at times, I find written briefs preferable to deliver quality work in accordance with customer requirements and to avoid conflicting situations. In this section of the brief we should succinctly and objectively describe the brand: your vision, the industry in which you operate and the elements that differentiate you from your competitors. This information gives writers a general idea about who you are and what your brand stands for. As for the specific project you are outsourcing, it is important to clarify its overall purpose, the topic and the angle from which you wish the subject to be treated. For example, a blog post discussing RRSPs could be oriented towards the investment vehicle’s tax-reducing benefits, its efficiency over time, contribution rules, etc. The angle must be clear right away, else the writer might have no choice but to improvise! Describe high-level goals as clearly as possible. It is important for writers to grasp exactly what you want to achieve, because the nature of the objectives will influence your plan’s direction. The writer will be able to produce a better outcome if he or she knows your main objectives (i.e. to raise awareness, to increase sales of a product or service, etc.). These details will supply the copywriter with a clear bigger picture, and this understanding will often be reflected subtly throughout the text. 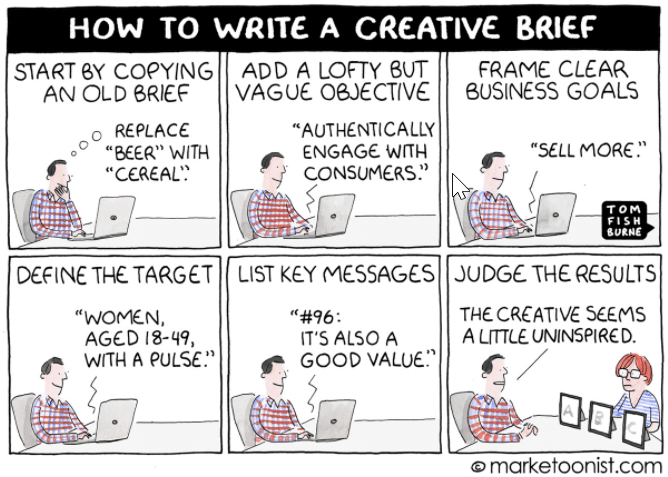 Your target audience obviously also defines the creative process’s direction. Therefore, make sure to include as much relevant information on your readers as possible, i.e. demographic data, relevant behaviour-related insights, purchase patterns, etc. To go back to the RRSP example I used earlier—if you want to create content promoting this investment vehicle to millennials, mention it! The writer could easily think he’s writing for Baby Boomers and adapt the text accordingly. As these two age groups have very different financial goals, the article should be written to target only one segment and this should be reflected in your content. If other communication materials are available, it is useful to share them with the writer, as they can help determine the voice, tone and style of the brand, as well as get an idea of the customer’s design needs, expectations and taste. Does the brand have a commercial, narrative, playful, or rather serious voice online? Is its vocabulary simple, intricate, familiar? These are important specifications which should be addressed in the brief. If you are not certain about your brand’s character, take a full stop. Call a meeting with the right people, figure it out, or—if you’re a startup—define it. Your brand’s personality must be loud and clear—to your clientele, first of all!—and to everyone who is involved in the content creation process. Have a distinctive voice online, one which transpires through every word, photo and sound you publish—or else you could end up being a forgotten logo in the cold brand graveyard. Timeliness plays an equally important role, as our clients may have rigid deadlines due to events and other marketing initiatives around which new content is created. Depending on the client’s and copywriter’s reactivity and on the mandate’s scope and urgency, the first draft deadline should be set at least 2 weeks prior to the publication date. This will minimize the risks of encountering publication delays in the eventuality that several rounds of revisions are needed, or should other roadblocks get in the way. Visuals are oftentimes included in blog posts only after the content has been finalized, bypassing the writer altogether in the process. However, implicating the copywriters in the choice of visuals is often beneficial, as they could propose images that provide additional details and value to the written text. An image is worth 1000 words after all. If you choose to involve the copywriter in the image selection process, you should be clear about the preferred style, as you may have a taste for minimalist designs while they envision intricate floral patterns. You already know what you like/dislike in terms of visuals, but it is not always obvious to put it into words. Should that be the case, simply provide your copywriter with models of preferred designs for guidance. Because we want to make sure that Google and other search engines properly interpret and rank our content, it is important that SEO-impacting elements such as the content itself, the blog post title, descriptions, images, URLs and links are well optimized. The golden rule is as follows: Each page of your blog must have a main objective, a goal, a raison d’être. In a blog context, a post listing the latest SEO trends aims to answer queries such as “SEO trends 2017,””latest SEO trends,” “SEO new trends,” etc. It is on these keywords that we aim to position ourselves. In other words, we want to be referenced among the first resources (or ideally the first resource) that Google offers to Internet users who want to consult the latest trends in search engine optimization. Be as light as possible, to minimize their impact on the page’s loading time. Any internal or external links in the body of the page should be useful, trustworthy and the anchor text should be representative and explicit (avoid links on “click here,” “this page,” etc.). Use external links sparingly. To resume, the content brief is an informative document that the client/agency offers to its writers. This document should have all the information necessary without the need for the copywriter to ask more questions or to have to further investigate certain aspects. A good brief is complete and conveys the marketing objectives, target audience research, brand information and SEO data necessary to paint a clear picture. Planning on creating new content soon? You don’t need to reinvent the wheel. Download our content brief template or use it through Google Doc! Before joining the Content Marketing team, Cristian founded and managed an e-commerce company for 2 years. Thanks to this experience and his projects in content marketing, he possesses skills in marketing, web development, digital business management, optimization, and SEO.